What is Growth-Driven Design? #Infographic ~ Visualistan '+g+"
With the ever-evolving world of marketing, businesses are spending an excessive amount of time and money on traditional website redesign, usually resulting in late launches and budgetary overruns. Traditional website redesigns can be unpredictable and receive little or no periodic updating and improvement which, more often than not, necessitates a further redesign as soon as one-to-two years later. 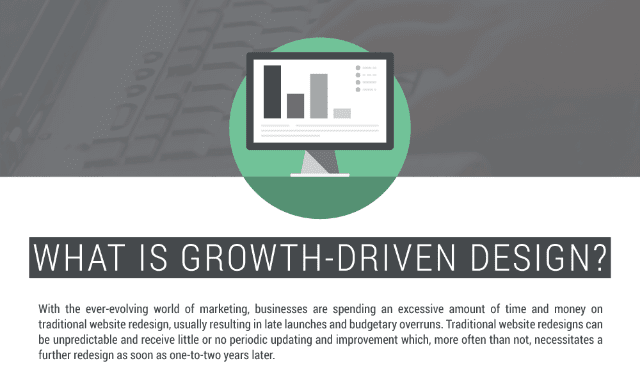 Growth-Driven Design is a new approach to website redesign. It allows for reduced upfront cost and continuous improvements to your site over time, which keeps your site current and timeless. Growth-Driven Design is proven to create better results for your clients and for your own brand. Take a look below to see what Growth-Driven Design is all about.